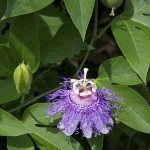 We have three lovely passion flower plants. A friend has asked for a piece to plant. Is it possible to take a clipping and root it out in water or something? If this is possible, would you give me directions on how to do this?